I have been very quiet on the internet and haven’t blogged for more than two months. I have also been quite inactive on the social media networks, so maybe some of you thought that I gave up blogging completely. In these three posts I wrote about my plans to take a TEFL course and get TEFL certified to be able to teach English as a Foreign Language abroad. TEFL stands for Teaching English as a Foreign Language. Well, that’s what I have done between late July and early October. I took a 120 hours Online TEFL course, I finally got my TEFL certificate and I even managed to pass at grade A. Many of you who have done a TEFL course might ask why I make such a huge thing of it? Well, it has been a bit of an odyssee till I got it. After my second, but by the latest after my third visit to Beijing (my fourth visit to China) last year in August and September I knew that I don’t only want to return as a „normal“ traveller and visitor but that I would like to live and work in China for a while (yeah, I know, I have mentioned that on my blog many times already!). I planned to take an online TEFL course while working as an English teacher in the Middle Kingdom. In January this year I started to apply for teaching jobs and I was offered a contract as a full time English teacher in Beijing by a local company in the capital pretty much right away. But somehow I felt uncomfortable and screwed with the contract and hesitated to sign it. After talking to Agness from eTramping and Rebekah from Mountains and Passports who had both worked as English teachers in China, it turned out that the contract wasn’t only not great but maybe even a bit dodgy. Instead I decided to get my TEFL first before starting to teach. I found a great In-Class course which should have usually taken place in Beijing in March. It seemed to be really good and I was so excited when I registered myself. Unfortunately I was told that the course had to be cancelled due to a low number of participants only six days later. The same course was supposed to take place in June this year, but when I wanted to register myself it was booked out and in the end it didn’t run at all due to organizational problems with the local operator in Beijing. There was another kind of TEFL course in Beijing this summer which I had seriously considered to take. But no one could tell me anything about its quality and it wasn’t even clear whether it was a real TEFL course or just something similar which I feared most schools wouldn’t accept. I had also thought about taking the TEFL course in another destination but either the dates didn’t fit my schedule, the courses were booked out or there weren’t enough participants. So I decided to take the course online and somewhen between the 20th and the 25th July I finally started my 120-hours online TEFL course. 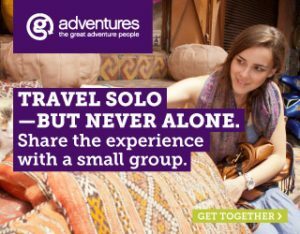 While I don’t mind travelling solo around the world, at least most of the times, tests and exams are not really my thing. To be honest I actually become a scaredy cat and start telling my family how much I fear that I could fail. While I only mentioned towards a few of the closest people around me that I was taking a TEFL course, I didn’t want to tell it on my blog. To me it felt that I had already written too much about it. That’s why I kept silent. I even didn’t tell most of my friends at all that I was doing a TEFL course. When taking the 120-hours online TEFL course there are 20 units. After each one you have to do a test to get access to the next lesson. At the beginning I started smoothly and took my breaks between the units, but my goal was always to have completed the TEFL course in early October, firstly for my Mom’s birthday on October 9th and secondly to be ready to fly to TBEX Asia which took place in Bangkok in mid-October. I didn’t want to fly there without having finished the course. So after the first lessons I increased my working speed and on the 29th September I had successfully completed all 20 units with an overall score of 98.58 percent. On the 6th October I submitted my final lesson plan and was told that I successfully completed the TEFL course only six hours later. Since I didn’t want to wait two, three or even four weeks to get my certificate I chose DHL delivery and got my certificate on the 9th October, right on my Mom’s birthday. Since she is a travel addict like me, she loved the idea that I was taking a TEFL course to have better chances to teach English abroad – well, hopefully! So the delivery of my TEFL certificate on her birthday was also a bit of a present for her although it probably couldn’t measure up with last year’s birthday which we celebrated in a nice restaurant in Beijing together with a local friend of mine, but hey, I did my best for this year as well. I had chosen the TEFL course with tutor support and video and I absolutely loved it. The course was very well structured and provided a great mix of grammar lessons and units about teaching. Most of the grammar was repitition for me because I have learned it already in school, but it was good to repeat it and I liked how it was presented. Most of the accompanying videos were great as well. 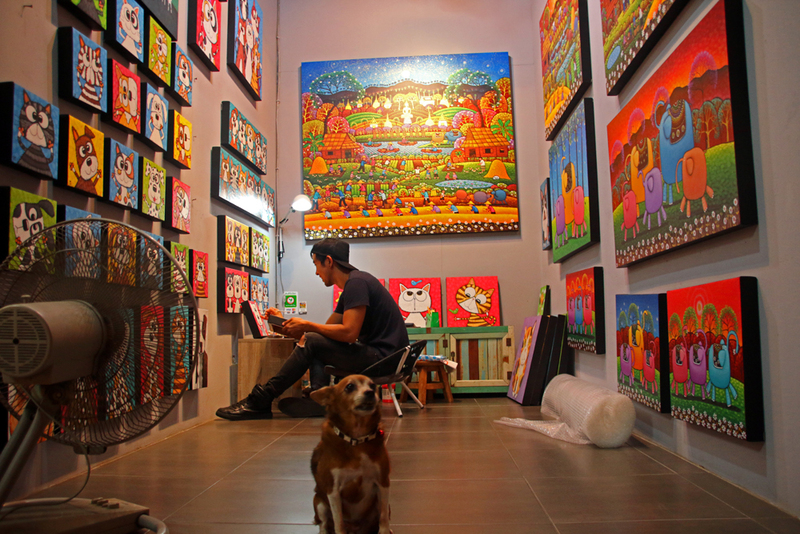 My tutor Tania was absolutely invaluable. She always answered my emails right away and she was very supportive and encouraging. Once she even responded to me on a Saturday to an email which I had sent to her on a Friday in the early afternoon (CET). As she is based in Phuket, Thailand, five hours ahead of Central Europe where I live, she read it on the Saturday and she even responded immediately although the tutor’s working hours are usually from Monday to Friday, not during the weekends. I am also more than grateful to the lovely Agness from eTramping who was so sweet and kind and didn’t only send me her lesson plans and worksheets as a guideline when I started the course, but who also reviewed my final lesson plan – the final task of the course – before I submitted it. On the 4th October, when I could foresee that I would have finished my TEFL course on time I registered myself for the TBEX Asia in Bangkok. Right after I was told that my final lesson plan was accepted and that I successfully completed the course, I booked my flights and only one week later I headed to Bangkok. 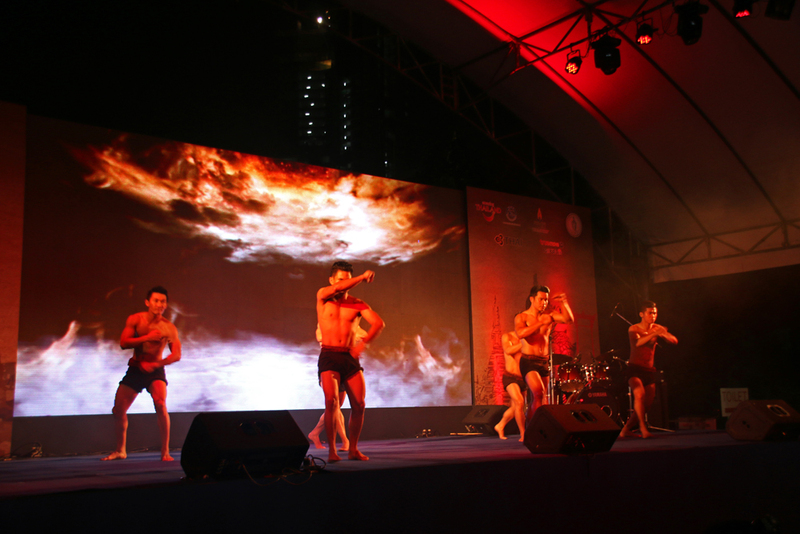 This time I joined Travel Massive at TBEX and the official opening party. I was really lucky to get one of the last two spaces for the Thai Spa, one of the Pre-BEX activities, and it has been the perfect treatment to get rid of the stress of the previous two and a half months. I met a lot of amazing travel bloggers, several who I have already met at TBEX Europe at the Costa Brava, quite a few who I only knew through their blogs till then and many new ones. 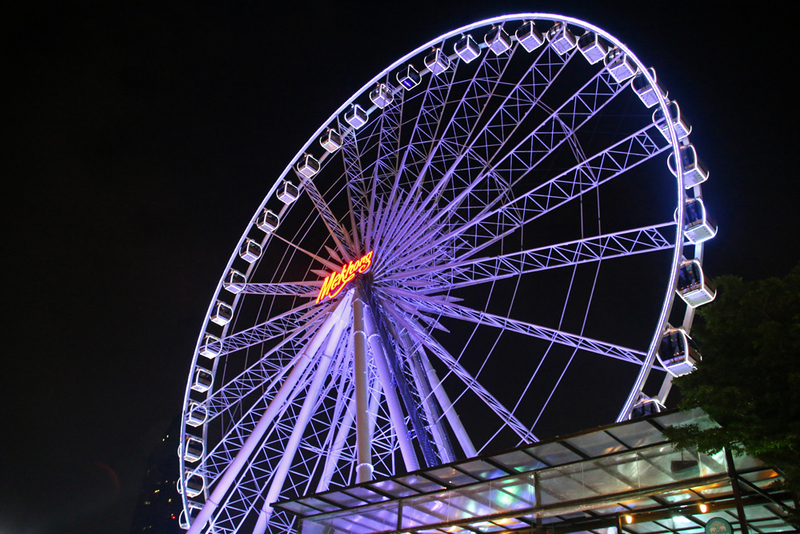 I highly enjoyed the sessions I attended, the whole TBEX program, the venue and the closing party which took place at Asiatique, a big shopping and dining indoor night market which is located at the banks of the Menam Chao Phraya river, in close proximity to the hotel where I usually stay when I am in Bangkok. 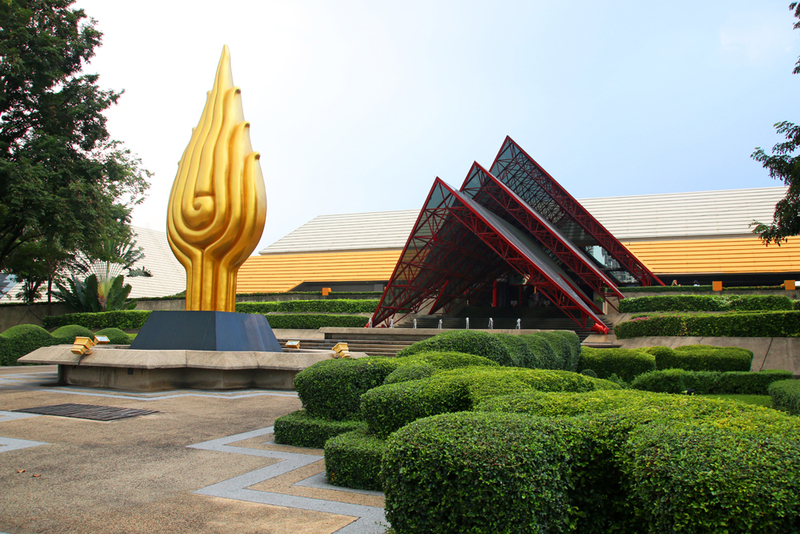 This is where I also stayed this time except of the days of the conference because the Hotel was very far away from the Queen Sirikit National Convention Center. 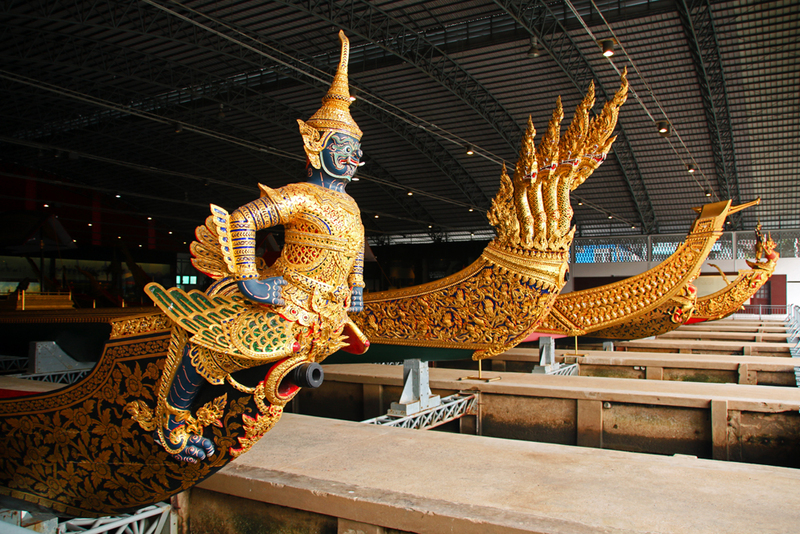 In the three days after the conference I finally explored the Royal Barge Museum – a place I had planned to visit for a long time -, strolled through the Chatuchak weekend market and revisited the Golden Mount. 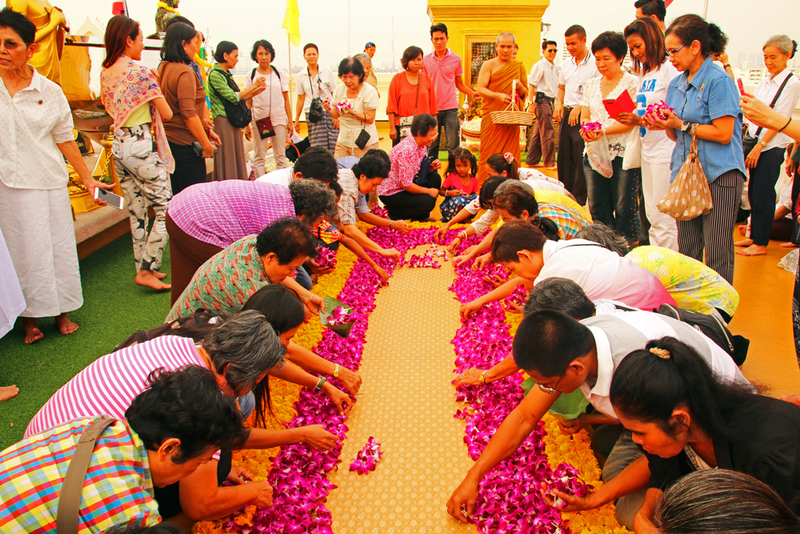 There I was very lucky to witness a Buddhist flower ceremony . I relaxed by the tropical hotel pool, enjoyed a few stress relieving massages and indulged my favourite Thai dishes. I am more than happy that I finally got my TEFL certificate and that I could attend TBEX Asia as I had planned and hoped for. Congratulations Vanessa! Online study (being self-motivated) is even harder. Well done and good luck with job hunting. I have loved working as an ESL teacher over the years and hope to do it again someday. Thank you so much for the kind words, Amanda, and especially for the good wishes. They are highly appreciated and I hope I’ll find a teaching job real soon. I totally agree with you, motivating yourself when doing the TEFL online is harder as if you take the course In-Class, but I am so glad I did it. I keep my fingers crossed for you that you will work as an EFL teacher again in the future. It was lovely to meet you at TBEX Asia in Bangkok and I hope to see you next year in Manila. Congratulations! I’ve thought about getting my TEFL cert for years but still haven’t gotten around to it. It would be nice to have all those English teaching options though! Thank you so much for the kind words, Edna. 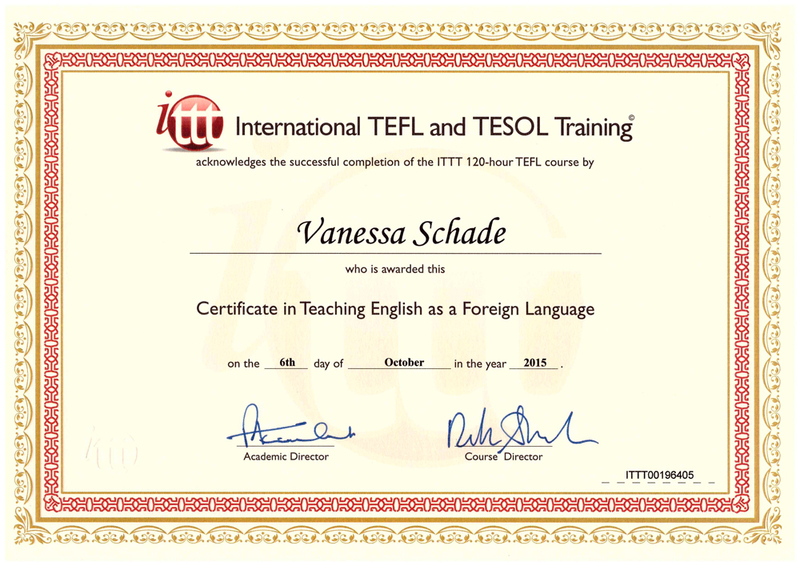 I hope that having the TEFL certificate makes it easier to find a teaching position abroad. It won’t be as easy for me as it would be for you because I am not an English native speaker but I hope there will be still enough options. I can highly recommend to take the TEFL course either online or In-Class, it was very-interesting and helpful and besides most of the grammar I learned a lot that I didn’t know before. Congratulations sweetie. You did a great job and I know how much work you’ve put into this certificate. You will be a great teacher. Wishing you best of luck! Many congratulations Vanessa. You’ve got heaps of enthusiasm and a love for China, I know you’ll be a great teacher! 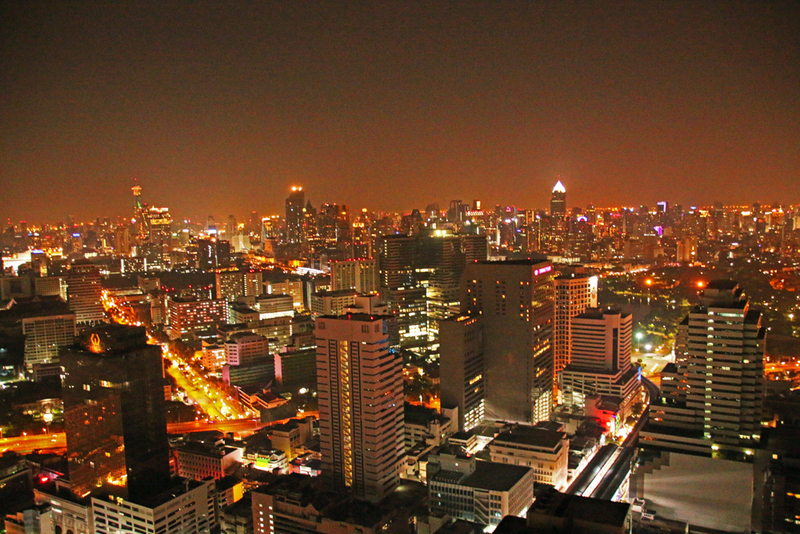 I didn’t go to TBEX Asia as I was in Bangkok (twice) last summer, so I’m looking forward to more posts about it. I hear it was great fun for all! Victoria@ The British Berliner recently posted…My second glorious press trip to England. Yes, I’m going to Bristol & Bath. Yipee! Thanks so much for the kind words, Victoria, I hope, I’ll find a good teaching position in China – I can’t wait to start. 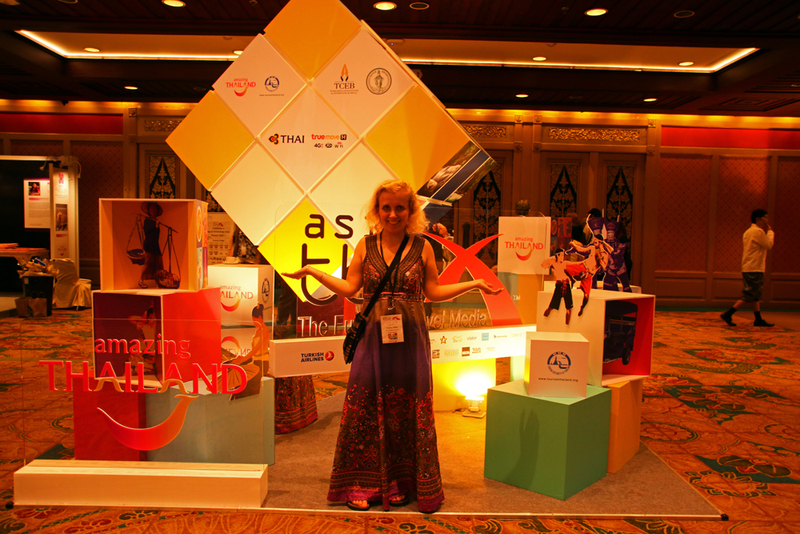 TBEX Asia was amazing and I will write more about it in the near future. Dein Bericht ist echt super spannend! Vielen Dank für Deine nette Worte, Jean, und entschuldige, dass ich erst jetzt auf Deinen Kommentar antworte. Er ist aus mir unerklärlichen Gründen im Spamordner gelandet. Wie ich schon schrieb, würde ich sehr gerne Englisch im Ausland unterrichten, allerdings nur wenn ich einen seriösen Arbeitsvertrag in der von mir favorisierten Stadt bekommen kann.